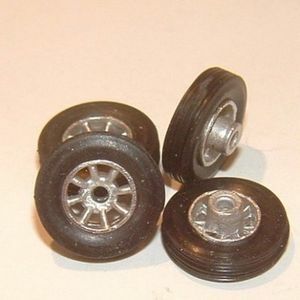 Wheel Rims - Set of 4 styled like a MiniLite rim. Uses 15mm tyre, O.D. (with tyre) 15mm : 4mm thick : 4mm thick at the inside axle stub : Uses a slotted tyre and has a raised rim ridge. Visible Rim O.D. 9mm : Axle stub 3.5mm dia. Axle size approx 2mm. Suits models like MGA, D Type Jaguar, etc.